Overall: We finally understand why everyone raves about Paris. It’s everything that people say it is (see paris: i heart paris) and more. As long as you embrace the snobby waiters as an essential part of your experience here, we think you’ll love this city too. What we did: A week and a half in Paris falling in love with this city (and watching the end of the Tour de France). We did just what you think we’d do in this city – walk around on the streets, shop, sip coffee, drink wine, sample cheeses and eat to-die-for pastries! Essentials: Bring the bare minimum, your money (and a willingness to spend it), extra suitcase space and get everything else when you arrive. Non-essentials: A negative attitude about the Parisians and the way they’ll treat you. We encountered a couple of snobby waiters and just considered it a part of the total Paris experience. Food: Kick your low-carb diet to the curb and indulge in the incredible pastries in Paris. We just can’t figure out how they make them soooooo good. Stay out of the touristy spots and try to find some good local bistros. You may not know what you’re ordering (and you may not want to) but it’ll probably taste pretty good. Oh, and a few words of advice…foie gras, foie gras, fois gras. Crepes and food in touristy areas were generally disappointing. People: Beautifully put-together and too pre-occupied to care about talking to you. Seriously, we did meet some friendly folks, but for the most part we were less comfortable striking up conversations with strangers than we usually are. Weather: It’s the end of July, still in their tourist high-season and the Parisians are gone on vacation, and it rains almost everyday. We’re trying to figure out why all the tourists would come now? Getting around: The subway is convenient and fast and can get you to most parts of the city. Cost of Living: Expensive (!) and that’s coming from a couple of San Franciscans. You just have to ready yourself to part with your Euros here. Daily budget: Ouch. After a lot of searching we rented a small apartment in the 5th arrondissement for $80 USD/night. We shopped in the local farmer’s market and bakeries and only ate out occasionally. On meals we spent about $30 USD/day. A dinner for 2 at a mid-range restaurant with a glass of wine is $100+. The good news is you can buy good bottles of local wine very cheaply (<€5). Renting an apartment: Our apartment was comfortable (but small) and saved us a lot of money since it was cheaper than a hotel and we made a lot of our own food. - Monuments: Okay, okay, so Paris has a lot of monuments (the Eiffel Tower, Notre Dame, Sacré-Coeur, the Pompidou Center, Saint Sulpice, and the list goes on). We'll spare you a rundown of all these since you can find them in any and every guidebook. Instead, we'll concentrate on some things that might not be quite as obvious. - Jardin des Tuileries: Worth a walk through. It’s not as green and lush as we expected but it’s romantic and well-manicured. - Musée d'Orsay: A light and airy museum in a renovated old train station. It’s amazing to see some of the most famous paintings and sculpture in the world, up close and in person. 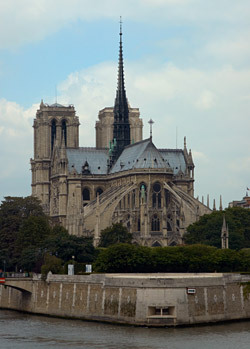 - The Seine River: This river slices through Paris and a walk (or several) along its banks and across its many bridges is an essential part of taking in the city. We especially recommend bringing a picnic dinner one evening and joining the locals who set up along the banks. 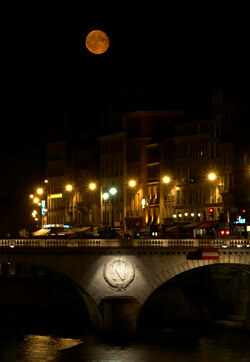 It’s wonderfully romantic and tons of young Parisians enjoy their evenings here. - Paris Plage (along the river Seine): This 2000 ton sand beach in the middle of the city was launched in 2002 by Mayor Delanoe as a part of his vision to regenerate the Seine. For one month beginning July 21 (this year) volleyball courts, swimming pools and a row of beach umbrellas are set up along the right bank. - Les Halles: This is just a big shopping mall now, and not the good kind. We’d skip this unless you’re looking for…well…a shopping mall. - Catacombs: Spooky! Scary! Creepy! Cool. 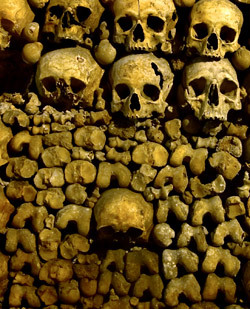 This underground mass tomb holds several million skeletons artfully arranged through a maze of tunnels. If you’re not claustrophobic, this is an interesting place to spend a few hours. - WHSmith’s bookstore: If you’ve been on the road awhile (like us) and need some books in English, this place is gigantic and has tons of books in English – what a luxury. - Eiffel Tower: Wow. We said we weren't going to talk about monuments. Even though the Eiffel Tower is about as touristy as you can get, it’s still pretty darn impressive and, well, it just makes you feel like you’re SO in Paris. Pack a picnic for lunch or dinner and eat out on the lawn like the rest of the Parisians and tourists. The kitsch light display at night (5 minutes at the beginning of each hour) is pretty funny. And yeah, going up in the crazy elevators is worth it. - Boulevard Saint-Germain: has a nice outdoor market. - Le Grande Épicerie Paris at Le Bon Marché: Le Bon Marché is a big ol' department store-ish sort of thing (with lots of other interesting stores nearby, too). For us the highlight was the immaculate grocery store: Le Grand Épicerie Paris. Foodies go crazy! If you like upscale groceries stores, then this is your paradise. Check out the paris gallery for pix of all the above! Went to Paris last summer and loved it. I actually met quite a few nice Parisians, but maybe that's because there was less of a language barrier as I'm somewhat fluent in French? Been following your travelog and loving it. You guys are great and so down to earth. Just wanna say another great attraction is Paris is Sainte Chappelle (one of the oldest churches in the city, not as touristy and so charming), not many people know about it though. Keep doing your thing.